"Live Free or Die" is the official motto of New Hampshire. Ronald Reagan said it was his favorite state motto. The motto was first written by General John Stark. General John Stark was New Hampshire's most distinguished hero of the Revolutionary War. You can keep the American revolution alive and share the same determination to remain free by wearing this unique T-shirt. It's great for the outdoors! This Ash Gray-colored shirt beautifully offsets the red, white, and blue flag logo. 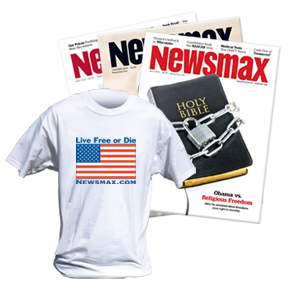 Made from 6 ounces of 100% cotton, a must-have item from Newsmax.